I’m not going to pretend that Tintin was a significant feature of my childhood, but I was aware of him and his adventures. Mrs SC feels much the same, although I think her childhood exposure may have been greater than my own. I have come across some of the Tintin books (along with one or two Lucky Lukes) among the pile of well-thumbed Asterix albums in my wife’s childhood home. It makes me think she and her siblings had a more French-oriented experience than my sister and I. Here in Belgium Tintin is something of a national hero. 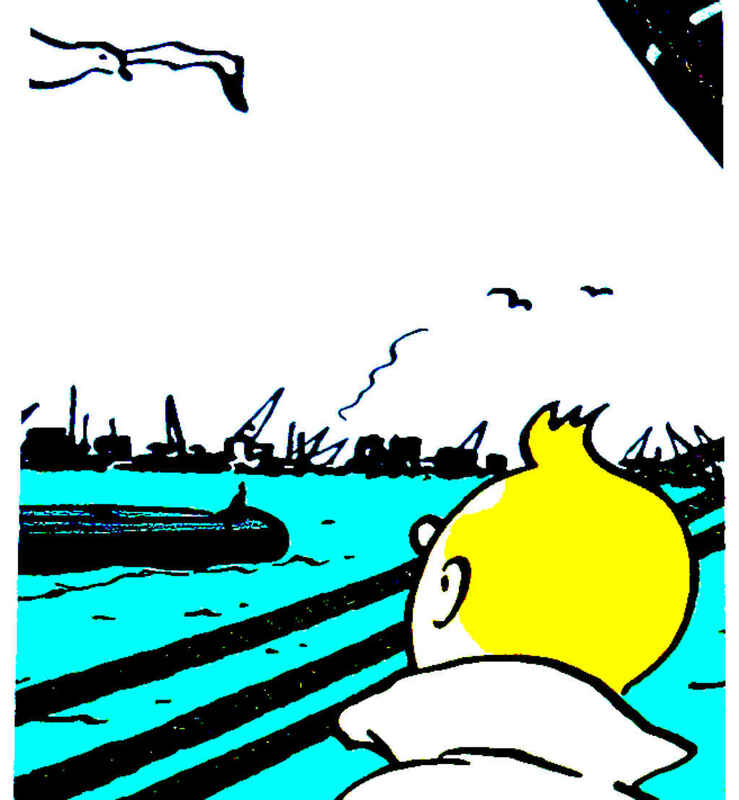 You soon realise (if you didn’t know it already) that Tintin’s creator, Georges Remi, was Belgian. Remi’s initials, reversed (RG) and spoken in a French accent become Hergé, which is how he signed his cartoons. There’s even a Hergé museum, which is where Mrs SC and I found ourselves on Sunday. Like many places in Wallonia it is at one time not that far away, yet not the easiest place to get to. Located in a town called Louvain-la-Neuve. It’s a fairly short train journey from Brussels, but for us at least finding the train wasn’t straightforward. The museum has a website with instructions for “Localization”, and it advises train travellers to visit the SNCB website – this is the website of Belgian Rail. Belgian Rail has a search function where you can input your departure point and destination (“station, stop, address”). In theory this will get you information about your train. However, you do have to know exactly where you are going. The Hergé museum advises you to choose destination Louvain-la-Neuve, but do so and the search engine replies: Your input is ambiguous. It then gives you about twenty options to choose among. There are a lot of stops at Louvain-la-Neuve, but none of them is the Hergé museum. Our first attempt to visit the museum was scuttled by this confusion. However, we persisted and the next time we were in the Brussels Central Station we asked a young man with “Student” printed across his Belgian Rail sweatshirt. “Ah, no. What you want is Louvain-la-Neuve-Université because the museum is located next to l’Université de Louvain.” And so it was. Louvain-la-Neuve is a rather disturbing place. It appears to have been built completely new, sometime in the 1970s, solely to house the French language, Catholic University of Louvain. On Sunday morning it was giving a good impression of a film set for a rather creepy science-fiction/horror movie. One of those films in which most people have been stolen away by aliens, or turned into nocturnal zombies. The few people who remain go about their lives apparently oblivious to the population disaster that has struck their town. 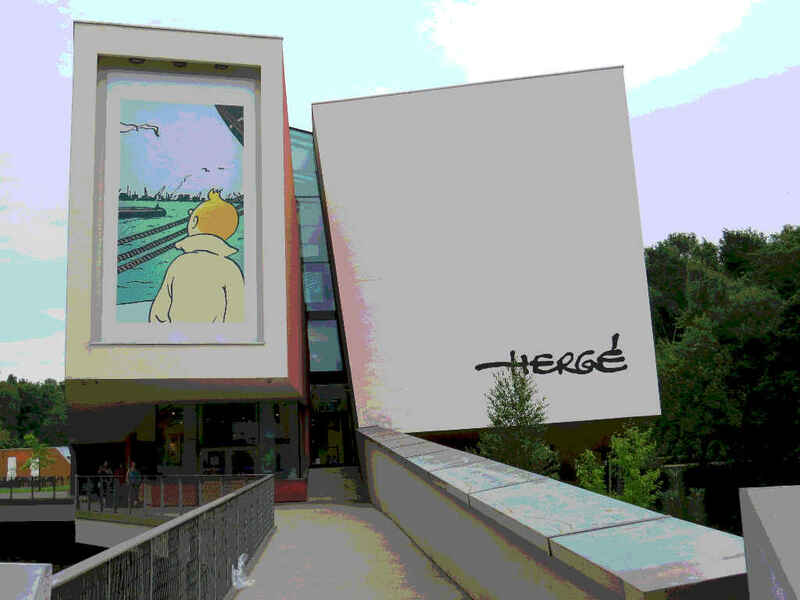 The Hergé museum is housed just a short walk from the echoing centre of Louvain-la-Neuve. It is a purpose-built, architecturally designed edifice that sits like a ship in a grassy dry dock, reached by bridges from a couple of sides. It’s an interesting building, odd angles and white with big windows. The entrance (as you can see from the photo) gives a passable imitation of an open book. One that’s been well-read and has pages coming loose. Sadly, the architecture is a wonderful shell for less inspiring contents. Seriously, the only reason Hergé is widely known – the only reason he has a whole museum dedicated to him – is because of Tintin. The tension between the man and his creation is palpable throughout the museum, and the curators are aware of it. At the very beginning of the audio guide one recorded voice demands to learn about Tintin. Another voice promises Tintin but insists there is so much more. But there really isn’t. Not here, anyway. And actually there’s not a lot of Tintin either. Perhaps that’s unfair. There is a lot of Tintin, but so many opportunities are missed. Considering museum’s star attraction is not Hergé but Tintin, a beloved children’s cartoon character, the museum is absolutely not designed to appeal to children. In fact, I think the only people who might find the Hergé Museum truly gripping would be the sort of adults who collect comic books and memorabilia. Despite the museum’s attempts to enter the digital age with an audio guide on a smartphone, the material it has is presented in a crushingly traditional way. Glass cases display objects Hergé owned; framed pictures of original strips hang on the walls… and that’s about it. Beautifully lit, spacious, architecturally designed gallery after gallery with glass boxes and framed pictures. For variety there are occasional video screens. There’s almost nothing to do but walk, look, read, listen. The relief when we found Hergé’s collection of stereoscope images and were able to operate the machines to switch pictures. It wasn’t much, but in the desert of monotony one learns to be grateful for even a little variety. More than this, after a short while you begin to suspect the museum is presenting a highly edited account of Tintin and Hergé’s lives. So highly edited that the same information, the same pictures, the same video clips are recycled in the galleries and the audio guide over and again. We gave up listening to the guide during what seemed to be the third run-through of Hergé’s biography. We gave up on the museum itself after the fourth or fifth gallery. The museum shop and “café” between them show the that the museum has clearly identified the economic group it appeals to. The shop is packed with overpriced memorabilia – mostly plastic resin models of Tintin and other characters from the albums. Want a Tintin moon rocket? It comes in sizes from a few centimetres high to one taller than a full-grown Belgian man (1.786). You can also buy Tintin albums in various translations. (So there is something for the kids after all). You can probably get a fizzy drink or a cup of coffee in the café too, if you ask really nicely, but you wouldn’t know it from reading the bill of fare. Three course meals are what they want to sell you. We decided the museum had already got enough of our cash and went looking for something else. We ended up eating largely tasteless but faintly savoury waffles at a Belgian fast-food establishment in the by now slightly more awake Louvain-la-Neuve. Hardly a culinary delight, but not nearly as expensive as the food in the Hergé Café. And after that we took ourselves back to Brussels. So that was our Sunday. I originally published this article on the separate Stops and Stories website. Transferred here with a little polishing for SEO and a new featured image 8 November 2017.